"Nope, but that's what I used to call it too. Truthfully, I still do sometimes. 'Guh-nochi' is more fun to say," I smiled at myself. BF ignored my quip. "Gn-occhi?" he asked, guessing once again. "Gnocchi. Nyo-kE," I said sounding it out. "Gnocchi. Okay, yeah... who decided to spell it this way?" "Ah," he gave the cookbook I was holding a look that reflected his confusion towards the messed up world of international linguistics. I smiled in a way that assured him that I agreed with his silent conclusion. Gnocchi was one of my New Years resolutions this year. This last January first I had decided to make a mental list that I could actually follow through with, ones with resolutions I could actually scratch off. Too often had plans to learn French, teach myself to juggle, and buy flowers more often been put up on a dust covered shelf with a note pinned on, "Do later. No time." Others were simply forgotten and left in to stew in the rot of gutters of city streets. The impetus finally came when I picked up a copy of Pasta Sfoglia by Ron and Colleen Suhanosky, the chef-owners of the Sfoglia restaurants in Nantucket and Manhattan. Now pasta, and Italian in general, is not my strong suit in cooking. I have ruined spaghetti, laid waste to perfectly good lasagnas, and ravaged raviolis until they were burnt to the bottom of my pot. Seriously, I cannot cook non-Asian food for the life of me. However, this book however had a welcoming approach. All the recipes are unique and intriguing utilizing for the most part ingredients I can find and afford. Furthermore, it has a section on making pasta and gnocchi from scratch. I purchased it on a whim and took it home hoping the fact I had spent money I didn't have would be enough to propel me into crossing a resolution off my list. "Sweet potato gnocchi," I read to myself. It sounded so simple, yet outrageous. A concrete recipe given new life through a modern twist. I rushed to the farmer's market for some russets then dashed over to Elise's to borrow her potato ricer (a mandatory piece of equipment needed for gnocchi that I did not have as I can't say I have a fervent need to rice potatoes very regularly) with the promise to return it before nightfall or face the wrath of Father Bauer (who apparently rices many potatoes). Since the man can fell trees with his bare hands I made sure to rush home and begin my project with the utmost speed. A short roast and some ricing went underway; then an egg, salt, flour and a bit of maple syrup came together to form a dough. 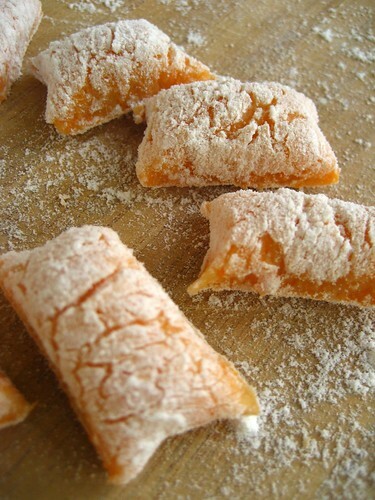 The dough was then rolled into ropes and cut into puffy pillows of burnt orange dough. Delicate and fragrant. Their rustic appearance was beyond adorable and I couldn't help but coo at them as if they were tiny little puppies - they were certainly as soft as one. Now new processes and ventures into the world of food are rarely pretty and usually involve plenty of scrubbing. The kitchen however did not feel the same way about the process as I had. A storm of flour had coated every possible surface, and every speck of it had been somehow cemented into place by the fine layer of starch from the potatoes. Pots were stacked, some I couldn't recall what I had even used them for and I wondered if some, unhappy with how they had been so poorly washed before - I have no dishwasher - had crept back into the pile when I wasn't looking. In the end I had made two and a half pounds of sweet potato gnocchi. Enough to make nine or ten satisfying servings as each little puff expands into a mightier, floofier puff. It was an epic undertaking. One I would be happy to do again. Just not again any time soon. I froze the bulk of it and later gave some to Elise and Father Bauer when I returned the ricer. I threw some into some boiling water and watched intently for them to rise to the surface; the inevitable proof I had made them properly. My elated screams were met with BF's quizzical stare when I squealed, "They rose! They rose! Can you see this!? The gnocchi! They've bobbed to the surface! My happy, sweet gnocchi!" I would have cried had they not. BF simply turned his head back to playing Warcraft as by now he was used to my kitchen mood swings. Since they were so sweet from the maple syrup and sweet potatoes I served them with a quick sauce of tomatoes, garlic, Italian sausage and capers. The dish was a fine balance of acid, brine, spice and sweet. Satisfying and amazing. Clock is ticking people, better get on your own lists. 1. Preheat oven to 400F. Wrap the potatoes and sweet potatoes in foil. Bake for an hour or until a tester goes in without any resistance. Let cool until you can handle them. 2. Peel and discard skins. Pass through a potato ricer into a large bowl. 3. Add the egg, salt, and maple syrup and mix. Add 1 cup of the flour and mix. Add the second and mix until well combined. 4. Turn onto a dry surface that has been lightly floured. Gently knead the dough into a 10 x8 inch log. Let rest for a few minutes. 5. Cut the log into four pieces. Lightly roll into a rope about 1 inch thick (give yourself a lot of space for this). Cut each rope into 1/2-inch gnocchi. Store on a lightly floured baking sheet in a single layer.. These can be cooked immediately. You will have tons however. Place them in the freezer in a single layer on a lightly floured sheet. When frozen you can toss them into an airtight container and keep in the freezer. Use within two weeks. When you do use them, allow them to thaw for 30-45 minutes in a single layer on a baking sheet. Bring a pot of well salted water to a boil. Add the gnocchi. They will sink to the bottom. After the gnocchi rise to the surface, let them cook a minute more. Scoop them out with a wire mesh skimmer or what-have-you and serve immediately with a favorite sauce. 1. Add butter to skillet and melt on medium-high heat. Add garlic, sausage, and capers and cook for 3-4 minutes. Add the tomatoes, salt, pepper, and wine. Cook for 2 minutes. Take off heat and cover. The gnocchi looks fantastic! Hurray you! I'm so tempted to try making it, but my Chinese family would probably just look at it and wonder what the hell I'm serving and whether they should eat something they can't even pronounce. I made fresh pasta before and the rolling out was a real pain, but the silky result was worth it. Try it some time! I love gnocchi. I also love making them but it's been months. The recipe you posted sounds really heavenly. I find it's therapeutic to make gnocchi. The only problem I have is that we don't real maple syrup here. But I would really love to make these. This looks just like a little piece of heaven right there!!! I have a little question though. Do you think a vegetable mill would do the trick if I don't have a potato ricer??? 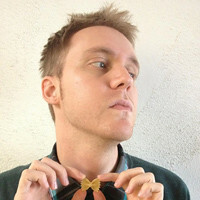 Thanks a million and by the way, I heart your blog! I can't wait to make these. We make gnocchi a lot but I haven't tried sweet potato. Thanks! Gnocchi was one of my favorite dishes from my mother's kitchen. This is a recipe she would have loved to try, she having been a big fan of sweet potatoes...I shall have to make them in memory of her. Garrett, since my mom always made large batches of gnocchi, we always froze them, but we never let them thaw before cooking. Do you know why thawing might be preferable? Patty - I assume to allow the gnocchi more elasticity to puff up more in cooking and to reduce cooking time. 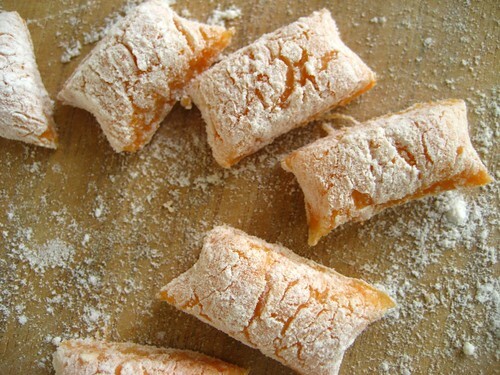 I have been looking for a great sweet potato gnocchi recipe, and yours is both simplest and best. I cannot wait to serve this and create my own kitchen disaster. Mmmm, going to have to try this recipe. Maybe with a browned butter & sage sauce? Gnocchi, the only pasta I can't resist. Love the recipe. Tnx! This recipe looks delicious! We're doing "Sweet Potato Week" on Haute Apple Pie (http://hauteapplepie.wordpress.com) I might have to give this one a try! These look AMAZING! I, too, have gnocchi on my list of things to do before the end of 2009. 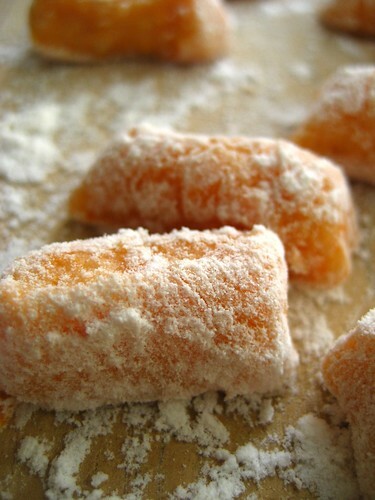 Thanks for helping me along with my list too- THESE gnocchi I just can't pass by! YUM! I've been dying to cook pasta with sweet potatoes and butternut squash. 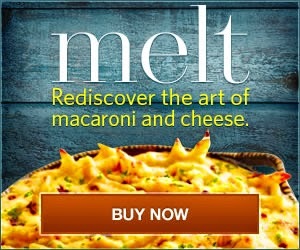 I'm much more of a savory person than sweet, and so I liked how you balanced the sweetness of the pasta with your sauce. Do you have any ideas for what I could replace the maple syrup with to make the pasta itself a bit less sweet? Thanks! Annonymous - More reasons I need to learn to juggle! Chelsea - Hmm... maybe a scant tablespoon of molasses? You could try to just leave it out all-together and see how that works for ya'. Mm, those look delectable! My husband is a fiend for both maple syrup and sweet potatoes so I have got to make these for him as a surprise. These sweet potato gnocchi were outstanding! We all loved them. While I was waiting for the water to boil, I quickly made a sauce to serve them with from plum tomatoes from our garden, some onion, garlic, basil, and olive oil. Thank you from bringing them over! Ah! I thought by "scratch", you meant you had broken a promise to yourself (in this case, abstaining from carbs, apparently, heh heh :). I've seen Pasta Sfoglia and it looks beautiful- as are these gnocchi. I made them earlier this year, but with a sieve instead of a ricer! But that's OK, I SOOO can't wait to make these! Made this sauce last night with some purchased sweet potato gnocchi. It was awesome. Next time I will make the gnocchi too. Who has made this recipe with any success? My dough was a disgusting mess and I followed instructions to the letter. 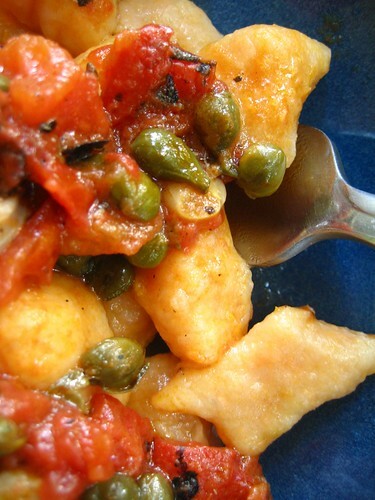 This is the second recipe I have tried for sweet potato gnocchi and had the same results. Anyone have any suggestions? Very upset at the waste of ingredients. Hmm. Just made it again the other night. Had no problems. I've used this recipe reliably for years. If two different recipes botched then it might be that you aren't kneading the dough enough or simply need to add a bit more flour.